It was the day of preparation, and the Jewish leaders didn't want the bodies hanging [on the crosses] the next day, which was the Sabbath (and a very special Sabbath, because it was Passover week). So they asked Pilate to hasten their deaths by ordering that their legs be broken. Then their bodies could be taken down. Have you ever caught yourself doing something awful and wrong just so you could carry out your sense of religious ritual? Most of us have! I can remember the time I came upon a car full of young Christian women who had run out of gas on the way to church. Hundreds had passed them, but none had offered to stop and help them. Ironically, they were all going to teach children's Bible classes, and most likely, some who passed them by were irritated that their child's teacher was late. Or how about the service staff at places where Christians eat on Sunday? Did you know that Sunday is the day most servers hate to work because "church people's" tips are low and they tend to be rude and demanding? 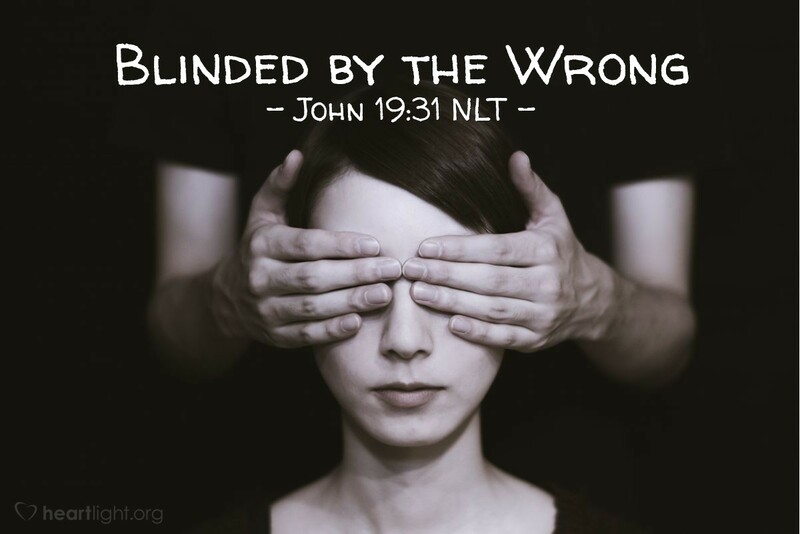 While comparing these things with a request to speed up the death of people being crucified is a stretch, these events should remind us that we have huge blind spots about the confession of our faith and our living it. Jesus was adamant that both our lives and our words should be completely consistent with our faith in him and our commitment to him. How are you doing on that score? What can you do to live the Gospel more fully today, and the days ahead? Forgive me, dear Heavenly Father, for sometimes being a better religious talker than I am a Christ-like servant. Convict my heart of what I need to do and give me a soft and courageous heart to do it with boldness and grace. In Jesus' name, I pray. Amen.